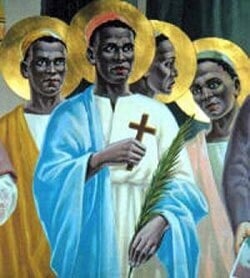 June 3 - Saints Charles Lwanga and Companions, Martyrs - Optional Memorial - My Catholic Life! A journey of personal conversion! Many of the faces of the saints in heaven that shine with the light of God will be dark faces. North Africa was one of the first regions to be evangelized and was home to a vibrant, diverse, and orthodox Church for over six hundred years. North Africa had over four hundred bishoprics and enriched the universal Church with a wealth of theologians, martyrs, and saints. This Catholic culture drowned under the crushing waves of Arab Muslim armies that inundated North Africa in the seventh century, altering its cultural and religious landscape. Small pockets of Christianity continued to exist in isolation for a few centuries more. But by 1830, when French colonists and missionaries settled in Tunisia and Algeria, local Christianity had totally disappeared. The Christian light had gone out in North Africa long ago. Yet today’s saints are nineteenth century African martyrs. While North Africa has remained in the tight grip of Islam, sub Saharan Africa has lived a contrary reality. It has embraced Christianity. Throughout the nineteenth century, daring missionary priests and religious from various European countries penetrated deep into the towns, savannas, jungles, and river deltas of the “dark continent,” carrying the light of Christ. For the most part they were well received, and initiated the long and complex process of evangelization, inculturation, and education that has turned today’s sub Saharan Africa into a largely Christian region. Charles Lwanga and his companion martyrs were all very young men, in their teens and twenties. They ran afoul of their local ruler for one reason and one reason only—they were Christians and adhered to Christian morality. The ruler did not otherwise question their loyalty, devotion, or service to him. He was suspicious of the European priests who had brought the faith, wary of outside interference in his kingdom, and also eager to impress his subjects with a display of ruthlessness and power. He was also a sodomite who wanted these young men to engage in unholy sexual acts with him. For refusing to satisfy his disordered and abusive lust, they became victims of homsexual violence. The ruler and his court questioned the young males who served as their pages and assistants to discover if they were catechumens, had been baptized, or knew how to pray. Those who answered “Yes” were killed for it. One was stabbed through the neck with a spear and another’s arm was cut off before he was beheaded. But most were marched miles to an execution site, cruelly treated for a week, then wrapped in reed matts and placed over a fire until their feet were singed. They were then given one last chance to abjure their faith. None did. These tightly wrapped human candles were then thrown onto a huge pyre where they returned to the dust from whence they came. One of the executioners even killed his own son. The executioners and onlookers knew their victims had succumbed to the flames when they no longer heard them praying. The site where these Ugandan martyrs died is now a popular shrine and a source of pride dear to the heart of African Catholics. Charles Lwanga and his companions, though new to the faith, acted with the maturity of the wise and the aged, choosing to sacrifice lives full of promise rather than surrender the pearl of greatest price—their Catholic faith. St. Charles Lwanga and companions, help us to be courageous in the face of threats, to stand tall for our beliefs, and to suffer scoffing, ridicule, and hatred rather than renounce or minimize our relationship with Christ and His truth.